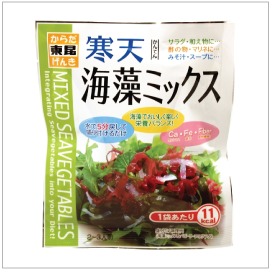 A mix of Kanten and variety of mineral-rich seaweeds. Simply soak in water for 5 minutes, drain excess water and use in recipes. Kanten, or more commonly known as agar in the US, is a jelly-like food made from seaweed. It is healthy, calorie-free and rich in dietary fiber.